“Eric came into this business full of enthusiasm and fire. His passion has not waned, but has become more focused and potent. He’s tackled social-justice issues, government corruption, elections, corporate malfeasance and urban issues, among many other topics, with verve and determination. And he can eat a burrito faster than anyone else I have seen.” – Brian Clarey, president of Beat Media Inc. 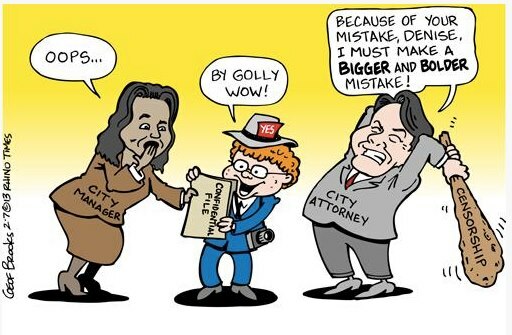 I was featured in a February 2013 cartoon (above) in the Rhinoceros Times for my investigative cover story about police surveillance of activists in Greensboro. A judge denied the City of Greensboro’s request for a temporary restraining order to prevent YES! Weekly from publishing the article, which was based on thousands of files obtained in multiple public-information requests, including information that the city claimed was confidential. The North Carolina Press Association presented me with an award for online breaking news in 2014 thanks to my coverage of fast-food protests. (I haven’t worked for an eligible newspaper since.) When I graduated with high honors from Guilford College, I was awarded membership in the Phi Alpha Theta History Society, named Senior Writer at the Guilfordian student newspaper, and received the Barton Parks Community Justice Award.